The outstanding attendance for Women’s Health Week 2018 was quite encouraging, because the good health of our members and their families is always a primary goal of our union. Like Men’s Health Week the primary focal points of Women’s Health Week were heart health and exercise. Women who visited any of the Health and Dental Centers for Women’s Health Week did not need an appointment to be able to receive testing and an exam that allows doctors to detect early signs of five different types of cancer: beast, cervical, skin, colon-rectal, and oral. In conjunction with the attention paid to heart health and exercise, tests were also provided to measure members’ blood pressure, cholesterol levels, as well as other health indicators. As always, information was provided on a number of other health issues that are specific to women, including menopause, infertility, osteoporosis, family planning and certain infectious diseases. Members could also get flu shots, which, we should add, remain available to all members and their families at the Health Centers without appointments being necessary. As we have reported before, it is indeed sad that too many people think that heart disease is a medical condition that mostly affects men. The unfortunate truth is that this misconception has probably led to the needless deaths of many, many women. In fact, more women die from heart disease each year than from anything else! One of the problems concerning women and heart disease is that too many believe that the only symptom is chest pain. But in fact there are other signs of heart disease in women, including difficulty breathing and sleeping, nausea, and back pain. The good news is that all women can greatly reduce their risk for heart disease. Giving up smoking is a must, and, yes, there was plenty of helpful information available on smoking cessation during Women’s Health Week. Getting your blood pressure checked regularly is an important health maintenance step, too. If it turns out you do have high blood pressure, which increases your risk of a heart attack, stroke, kidney disease and other conditions, it is usually controlled easily with medication, as well as non-medical steps such as low sodium (low salt) diets and regular exercise. Women should also have their cholesterol checked regularly. As Dr. Greenspan points out, blood pressure and cholesterol tests were available at the Health Centers during Women’s Health Week and they found members who had these conditions and might otherwise not have known about it. Members who attended Women’s Health Week were also reminded about the importance of a good diet and regular exercise. Yes, eating right and getting regular exercise can reduce one’s risk of heart disease, but they can also reduce the risk of various forms of cancer. The advice was to stay active. As an example, a simple activity like walking every day can greatly lower one’s chances of a heart attack or cancer. Brochures and demonstrations were also available on how to lose weight. Good nutrition, counting calories and getting plenty of exercise are all important factors in the process of maintaining good health, and additional information was available on all of these topics, as well as the immunizations adults should receive. There were special features, too, as always. 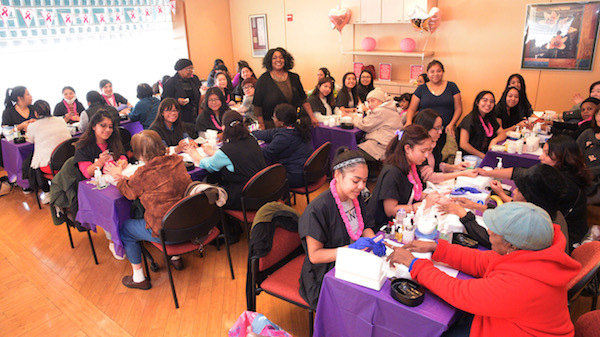 Queens Vocational Training students gave free manicures to many visitors to the health and wellness event. Yoga lessons were provided—and laughter therapy certainly had people smiling. And, yes, as always, nifty gift bags were distributed to all who attended Women’s Health Week 2018. It is also clear that attending Women’s Health Week 2018 gave many members peace of mind. As we’ve noted so many times before, getting a clean bill of health always makes one feel good. The vast majority of this year’s visitors to the Health and Dental Centers for Women’s Health Week ended up with clean bills of health. And that’s great news for all of us! Many of the members who attended Women’s Health Week in Queens received free manicures from Queens Vocational Training students.